For more than 40 years now, Kitco has been buying and selling silver coins and other physical precious metal bullion products. Silver investors often sell silver bullion coins to us given our competitive live silver coin prices and due to the high level of trust we have earned over all these years of conducting business around the world. Sell this third of four RCM Predator Silver Coin Series here online. Sell 2018 1 oz Silver Wolf Coins online to Kitco and easily create your own packing slip using our online store. Selecting the product you want to sell from our product list is simple. If you are not completely sure how or would prefer assistance, please call us at 1 877 775-4826 (US and Canada), 1 514 313-9999 (international). One of our Customer Service Representatives will help you to complete your sale. 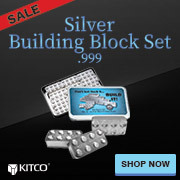 Why sell Silver Wolf Coins to Kitco? The Canadian Silver Wolf Coin(s) you sell and deliver to Kitco do not have to be in absolute mint condition.